Our latest Tennant Suit owner is probably the most unconventional to date. Lisa has been finding her’s on a budget - and managed to pick up some prestigious admirers along the way that I think we’d all be jealous of! 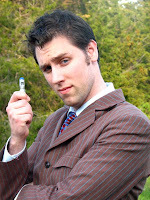 Favorite Doctor: Ten, David Tennant. Though in fairness I’ve only seen One, Eight, Nine and Ten so far. As you may know, I am making a pair of Six trousers, essential to get some practice before embarking on my Tennant suit trousers, but also for a little fun. The pattern I am using is from Laughing Moon Mercantile, and are a replica of a mid to late 19th Century design. 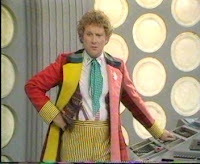 They are high waisted, intended to be held up with braces (as Colin Baker’s costume, see below) and have a button fly as well as a braced strapped back with hip pockets. 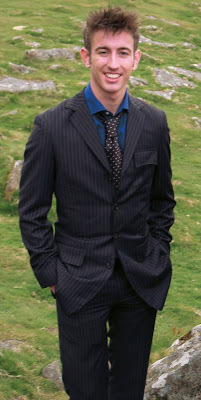 Most of these features match the trousers Colin Baker wore, however there are a couple of things that would need to be altered to make them more screen accurate: the pockets have horizontal entry where they should be vertical; the fly should be zipped not button; the waist-band needs to be narrower; and the back should not be split. For once this is not about making a 100% screen accurate garment. The purposes of this exercise is to test my ability to follow a commercial design rather than designing my own, so I intend adhering to the letter of the pattern throughout. I have also never worked with anything other than a plain fabric, so I am learning skills of more accurate cutting and lining up pinstripes, something I will need to master before the Tennant suit. When I did the Tennant Coat, I found it really useful and helpful to do a Calico Test before cutting my precious Alcantara fabric. It gave me the chance to assess fit; refine the pattern; and test out some design ideas to see how they would work. I am currently quickly making a pair of Six trousers, just to get my skills up to speed for making trousers for my Tennant suit. I am going through two calico tests before cutting my Yellow Ticking I have gone through hell to get right. The first is a quick mock-up with no pockets or fly front, but with the waist band, as this is integral to the cut of the trousers. This is solely to check that the pattern is sizing up right. I would hate to follow the pattern to the letter and get to the end only to find they are a circus clown fit on me or far too tight and can’t even get them on. As I explain before in Tailoring Trousers, I am copying a pattern from Laughing Moon Mercantile, and have prioritized preparing the pieces needed for the first calico test. It is then a simple case of cutting the pattern in calico and stitching up the necessary seams and add the waist band (see right). I found the fit around the waist to be pretty much spot on, but I felt the legs pantalooned out somewhat, so I will make some allowance for this before the second test. Once I have fed back these findings from the first test to the pattern, I set about making a more finished test garment, following the pattern instructions closely and including every step along the way. I was going to call this entry: “Well that’s annoying!”, but luckily I pulled things back from defeat. Things haven’t gone as planned this week. I previously posted that I am making a pair of Six trousers before doing the ones for the suit, so I can get some practice in. From the Six Breakdown on dw_cosplay I had found and ordered some of the Yellow Ticking (see left) from Interior Mall. Their website says they ship worldwide, but do not quote shipping prices, asking you to enquire direct for a quote. 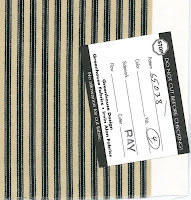 When I got a reply I found their shipping costs to the UK were very over priced at US$58 for sending just 4 yards of fabric (value US$70). 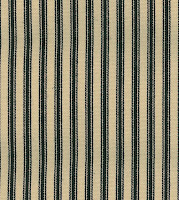 Luckily I have a friend in San Diego who had something to send me and he agreed to take delivery of the fabric and add it to the shipment before dispatching it to me. This simplified things, and I can’t thank him enough for making that happen. 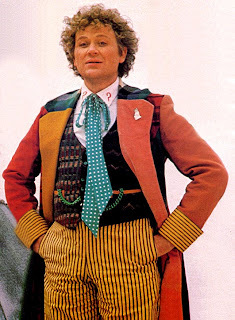 Before forwarding it on to me my friend thought the material was not quite right, saying his recollection of Colin Baker’s trousers was that they had a single stripe. I had always thought this as well, but had found that the trousers he wore for his first season were actually a triple stripe: two narrow ones either side of a thicker one. A nice clear image of this can be seen on DoctorWhoProps.com (see below). The Interior Mall fabric looked to be a good match. He also thought the colour was a little off, but I’d have to see that to know what he meant. The packaged arrived this week, and to my horror I saw exactly what he meant. It was totally the wrong colour! Instead of being a vibrant yellow it was a light oatmeal instead, and looked to be a match to another colour on their site, the swatch for which can be seen here (right). This was really annoying – thanks Ray (who cut and packed it according to the attached ticket). 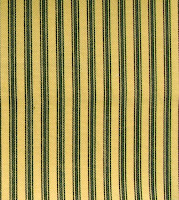 Pillow ticking, as this fabric is known, is relatively commonplace, and I had found several suppliers in the UK (Tinsmiths had a good range) though they did not have the right yellow with black stripes. So I had only gone to Interior Mall for the colour! So all that effort was effectively for nothing. 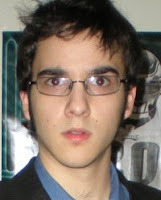 After last month’s profile of Tennant Suit owner Justin Monk, we now move to New York to meet our next proud owner, Dan. 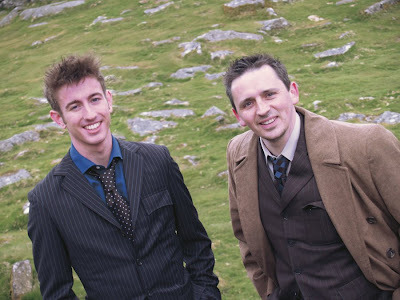 Dan bought his current suit from Baron Boutique in January 2009, but his first Tennant suit was purchased through eBay a few months earlier. Dan cast around, and eventually settled on the version from Baron Boutique. Sometimes you can spend too long looking at something and get too close to it and miss the bigger picture. Every now and then, to avoid this, I take a step back and reset to the very start of things, just to check I am not missing some obvious. Call it re-evaluation with hindsight. 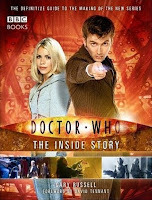 One of these landmarks for me is part of a chapter in Doctor Who: The Inside Story, a book published in October 2006, so within a few months of finishing David Tennant’s first full season as The Doctor. The text draws a lot from interviews with cast and crew, including Louise Page, designer of David’s costume. She speaks at length about how the suit came to be and the stages they went through before they arrived at the final design. Looking back at it, and now knowing what I know through researching the suit, there are a few comments which although they didn’t seem to make sense then, they very much do now . . . I have never made a pair of trousers in my life. I just want to clear that up! For the jacket part of the suit, I have deconstructed the Honest Dragon jacket and am cribbing some (but not all) of the pattern from there. The trousers, however, were the worst fit imaginable, being around 5 inches too big in the waist. There is no way I can successfully work with these, not having any experience of trousers. I therefore have bought a Vogue pattern for a classic Men’s Suit (GRE V1753), and will simply make the trousers to that pattern, brining into it the features of the Ten suit I have researched. But before I go head-long into making those, I thought I would get some practice in by making some other trousers first. I will run these in parallel with making the calico and moleskin jacket, so hopefully when I have nailed the jacket and the methods of making trousers, I will be all fired up and ready to make my Tennant suit from Jo-Ann fabric. I work best with a goal to focus my mind. So rather than just doing some random trousers, I have chosen to make some Six trousers, inspired by some previous postings on dw_cosplay entitled Six Breakdown. They are fairly loose, so tight tailoring is minimal, which I think will help my confidence while making them. Someone had found the right fabric Yellow Ticking (see left) and a suitable pattern from Laughing Moon Mercantile. I have never really done anything to a commercial pattern before, having always designed my own because I felt nothing else would be suitable. So while making these, I thought I’d share the experience of working with an established pattern. 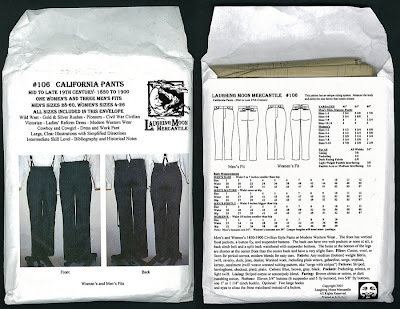 I ordered the Lauging Moon’s pattern #106, Californian Pants (see below), and the yellow ticking, which I hope to take delivery of soon. Mid to Late 19th Century (1850 - 1900) Civilian Style Pants. 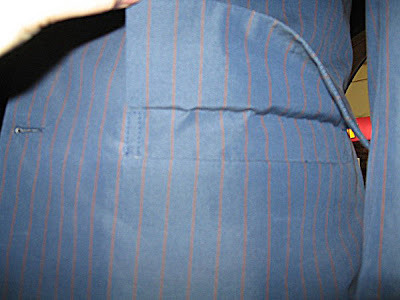 The front has vertical front pockets, a button fly, and suspender buttons. The back can have two welt pockets or none at all, a back cinch belt and a split back waistband with suspender buttons. The hems at the bottom of the legs are shorter at the center front than the center back and have a very slight flare. It’s time to nail the weird Faux Flap pockets! These pockets are the most curious and unique aspect of this suit. They defy convention and are hard to describe. Luckily, I was recently sent some pictures by a friend, Lisa, who took a closer look at the blue Tennant Suits on display at some recent exhibitions. My inspection of the suit at the Earl’s Court exhibition had been somewhat limited since it was covered by the overcoat. Lovely as it was to get up close and personal with the coat, it made a detailed study of the suit impractical. However, the exhibitions Lisa went to had the suits displayed without the coat, so it was a lot easier for her to take detail pictures without being too invasive. 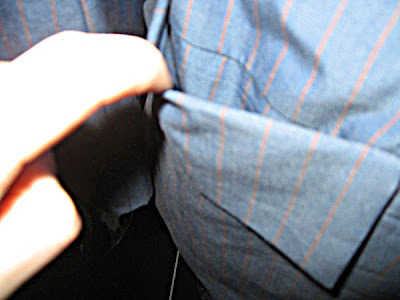 This first shot, looking down into the left-hand pocket, clearly shows the flap on the outside of the pocket (see above). 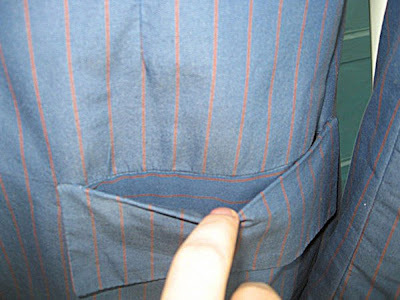 Note that the material inside the pocket has horizontal stripes. The next shot shows the right-hand pocket in the same way (see below). 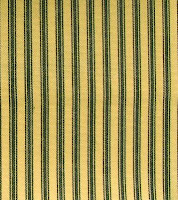 Note that this time the lining has vertical stripes. These are actually two different suits displayed at different exhibitions. Personally I think that it is purely an error of assembly when one of the suits was made, but working out which is ‘right’ and which is ‘wrong’ is hard. I have some ideas, but more on that in a later posting. 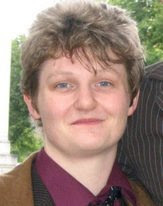 Following my request to hear from other proud Tennant suit owners, I am now pleased to present the first contributor. I have been in touch with Justin over the past few months and he has offered me a lot of helpful advise for getting my suit spot on. 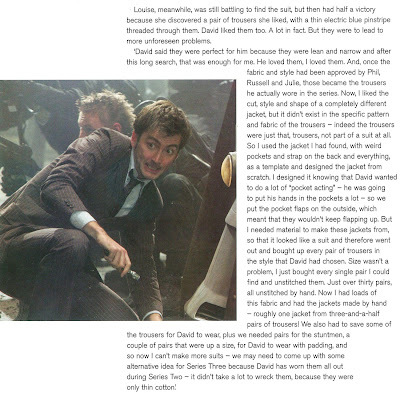 Here he shares with us his own personal quest for the perfect Tennant suit! Colour of suit: both versions! Justin is a seasoned cosplayer, and has costumes ranging from Stargate: Atlantis (seen right, Justin strikes an uncanny pose as Lt Col John Sheppard) through Anakin Skywalker from Attack Of The Clones (seen below left), to Doctor Who. “My first costume was a Jedi costume, which I painstaking researched, finding all the details here and there.” Justin (like me) is a complete perfectionist and went through five belts, four gloves, three tunics, three boots, two sets of pouches, three inner tunics, and two robes before he was totally happy. 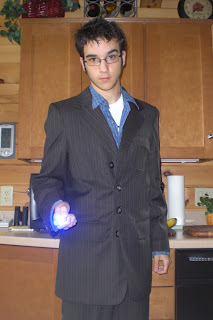 He got his current suit Tennant suit in November 2008, in time for Chicago TARDIS convention. He had a previous one made in 2006, but more on that later. “The suit is unique, vintage looking and overall something more interesting than the typical two-button suits around.” he told me, “I also have been told I look a little like Tennant, much moreso than the other Doctors, so good fit!” And why not! I haven’t been posting on here much for the past couple of weeks as I have been on holiday down in Devon and Cornwall. Yipeee! We had a great time and it was a good excuse for me to take in a couple of Who activities, one in either county, that I would not normally get the chance to visit. 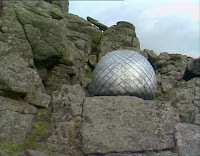 The first of these was a visit to Hound Tor, which had been the main location for the classic Tom Baker episode, The Sontaran Experiment. 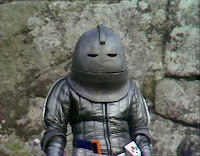 The story features the second appearance of the Sontarans and Hound Tor was the Earth in the far future where Field-Major Styre (left) lands his craft (below) to survey the planet for possible invasion material. I had found the location by looking on doctorwholocations.net and had put in the postcode of where we were staying in Devon, and found that Hound Tor was relatively not that far away. I had recently been chatting to a young lad called Guy, who has a Baron Boutique suit. I spotted that his profile said he lived in Devon, and since I would be in the area I thought it a good chance to meet up with him and see what a Baron’s suit looks like up close. Guy had only recently ordered his suit, so had as yet not taken any decent pictures, so Hound Tor seemed like a suitably dramatic and Who-related backdrop to use. We arranged to meet on Monday 5th May, the Bank Holiday, and as it happened we were not the only Who fans on the Tor that day. A full write up of that part of the visit can be found in the Making My Tennant Coat blog. Arranging to meet a random person on the top of a rock is, once you start thinking about it, is rather odd! So that Guy had a chance of finding me, I made a point of wear at least the coat so I would be conspicuous. I decided, in case Guy did not make, not to initially wear my suit, and would change into it once he joined me. After walking around the Tor for about half an hour spotting filming locations, we notice a tall, slim person walking up the hill towards us, wearing a snug-fitting suit: Guy had arrived! I felt a bit rotten dragging Guy all this way, especially since, being Dartmoor, it was quite windy and not that warm, and I don’t think his suit looked all that warm! I then popped back to the car to change into my own (Magnoli) suit and pulled on my Converses. Luckily (for me!) 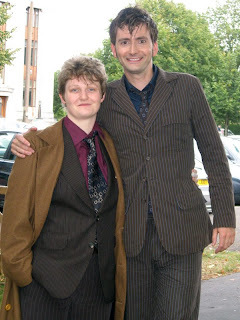 I kept my coat on and we posed for a quick photocall, both in out Tennant outfits (see below).